US President Barack Obama before the end of his presidential term will not be able to conclude the negotiations on the establishment of the Transatlantic Trade Partnership (TTIP), the EU countries because of the protests of the population will be forced to postpone negotiations until 2018 years, he told RIA Novosti independent MEP from Greece Notis Marias. According to him, the organization Greenpeace published secret documents TTIP confirmed the accusations, which were some of the MEPs. Discussion of the transatlantic agreement on trade and investment goes in secrecy. Its contents do not know a lot of European deputies, nor many ministers of the EU countries. Eurodeputies forbidden to report on the contents of the documents, take notes, photocopies. However, a few days ago there were leaks about the negotiations between the US and the EU. “After the disclosure of the organization Greenpeace secret documents TTIP citizens realized that in reality means TTIP that TTIP will destroy the agricultural sector in Europe, it will allow modified plants in Europe and it’s bad for public health that US multinational companies will dominate Europe and will close many small European companies, he rejects the labor rights of the citizens, that it threatens the environment, TNCs can apply for the Member States to the court to obtain compensation for damages, “- Marias said. According to him, for Greece, in particular, it is important that there are products with a protected designation – feta, olives Kalamon, fava Santorini, yogurt, which can lose their protection in the event of signing the agreement. “We, the MEPs, all spoke Now the disclosed secret documents, and the citizens they saw the beginning of a great counter Before that we had a little resistance, but now citizens actively oppose -… And Greece, a lot more protests in France and Germany “, – said the MEP. According to him, the upcoming elections in France and Germany would lead to a halt of negotiations. “French President Francois Hollande faces elections in 2017 year. He has already made the turn, the French social democracy and other Social Democrats say they are struggling with TTIP, they do not want it. They do so for reasons opportunist, by electoral reasons. it happens in Germany. Since there is great opposition, the Social Democrats and others (party) in Germany are forced to say that they do not want TTIP, they stop him. 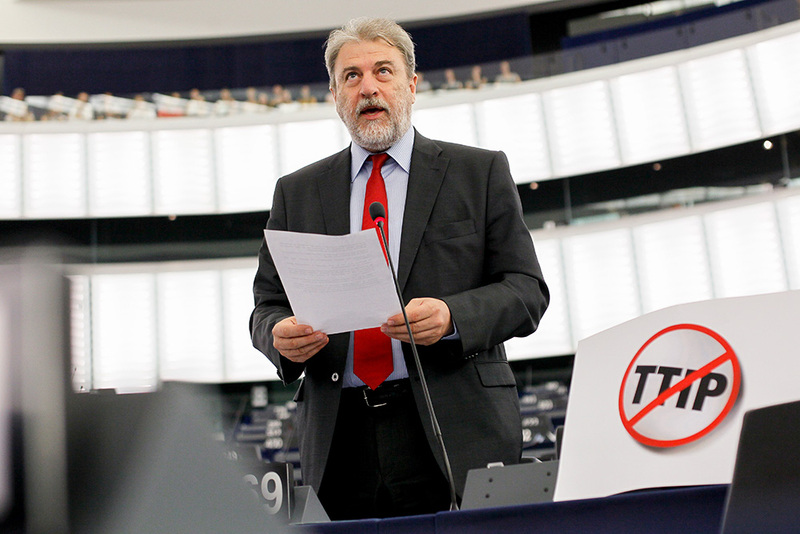 in my opinion, TTIP will not advance until the completed election 2017 year in France and Germany “, – said the MEP. “Obama’s plan to finish in the middle of TTIP 2016 years, while he is president, will not work”, – said the Marias. He hoped that the opponents of the agreement will be able to completely stop it. “We, those who for a long time struggling with the TTIP, are optimistic that we can organize a very big move, and almost stop the TTIP. I think at least until after the elections in France and Germany, it will be very hard to promote the TTIP. But it gives us the movement “Stop TTIP”, the best time to organize themselves in order to do less than this agreement “, – concluded the MEP. Since July 2013, the EU is negotiating the Transatlantic Partnership Agreement in the field of trade and investment. It is about creating the world’s largest free trade zone with a consumer market of about 820 million. In addition to the US and EU countries, the project will include Canada, Mexico, Switzerland, Liechtenstein, Norway and Iceland, as well as candidate countries for EU membership.